On November 4th 2011, I went to see Joel Osteen. Just the other day, a good friend of mine was making fun of me for it, asking somewhat jokingly, how could I buy into it? I told him to shut up and then started to cry. You see, when I was at Joel Osteen, a lady was speaking. She spoke about a woman whose only desire was to be a mother. All of the odds were against her but she knew that the Lord had planted that seed in her heart. After 20 years of praying and failed infertility treatments, she was on the verge of losing hope. She had a random encounter with a stranger that renewed her hope and a week later, she received a phone call about adopting twins- would she take them? The story was much longer and more detailed than what I am writing but when this story was being told, I had this overwhelming feeling that God was whispering to me that indeed, Munni would be my daughter. Ten days later on November 14, 2011 I received an email. It was from the agency where I found MG on the waiting children's list. 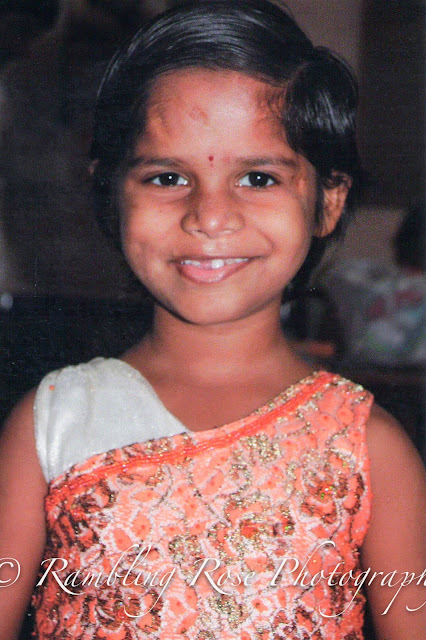 It simply stated, "Kristen, I am sorry to tell you that we won't be able to complete Munni's adoption. In addition, we are putting our waiting children program on hold. I wish I had better news." The End. No phone call, no comforting, nada. Crushed, devastated, bewildered, confused....all of those emotions were running around in my head. Hours earlier I had just won a fundraising grant with Ordinary Hero. Talk about a buzz kill. I prayed and prayed for clarity. Did I imagine what the Lord whispered to me at Joel Osteen? Am I crazy? No. Again, I heard the Lord tell me, "wait." And so I did. And I prayed every day and chose to trust that somehow, someway, He would bring about this adoption. I didn't tell anyone about the email because I felt that by spreading the bad news, would be giving life to it. EXACTLY one month later on December 14, 2011 a lady I didn't know contacted me through my blog. I can't tell you how amazing Sarah's heart is for the orphan. She asked me several questions about my adoption process and we exchanged emails. This was the first time that I shared what agency A had told me about not completing Munni's adoption. Then Sarah wrote me back and told me, "I have a back up plan for you." I don't doubt for a minute that God brought Sarah into my life! Talking with her renewed my hope to fight even harder for Munni. Sarah was in contact with another agency and had called them and advocated for Munni and me. Think about that! She didn't even know me but took the time to make phone calls and investigate options for me. To this day, I can't thank her enough. I don't think I will ever be able to put into words just how grateful I am for meeting her! Two days before Christmas, the situation was getting dire due to the change in adoption process in MG's country. Sarah called me and told me to call agency B and talk with the program director. She said that she was confident that they could help me. I made the call and that's when the Christmas Miracle occurred! I look back over this story and it makes me cry every time. I see how much the Lord loves sweet Munni and how much he loves me. The people he's weaved into our lives who brought encouragement and love, I wouldn't trade for anything. Back to the other day when I told my friend to shut up (we are very good friends so it wasn't mean like that) and I started to cry. I told him the night that I went to Joel Osteen gave me the hope I needed to keep battling for Munni. When people told me it wasn't going to happen, I held onto the truth that woman said that night: If God gives you a dream, he will honor that dream and bring it to fruition- EVEN when in our human minds, it doesn't seem possible. And so now, a year later, I am a couple weeks from boarding a plane to meet my daughter for the very first time. Oh Kristen, So much to be thankful on this Thanksgiving. Your sweet Munni has a gorgeous smile. He eyes are so bright! She will BLOOM even more in her Mama's care and love. As a friend reminded me after she heard it in a sermon at church- There is no COINCIDENCE, There is ONLY GOD. He planned it, and planted it- your call to adoption, you being at the Joel Osteen service, Sara contacting you, even Agency A not being able to process your paperwork for her. It was all planned... and it is all going as per HIS plan. He had already planned for you to be with Agency B, and for sweet Munni to be in your arms on the same exact date and time that he has already decided. So you enjoy the beautiful journey that he is taking you on, as he prepares you and Munni for your sweet meeting soon. Love you! Happy Thanksgiving! I don't have any words that could justice to these emotions I'm feeling from reading this post. I have chills! And I cannot wait for the day you finally get to meet your sweet daughter. Soon, Kristin. Soon! So beautiful. :) The Lord is so good...and so faithful to us. I love your story. Her sweet face melts my heart!! I love hearing your story and cannot wait to read along in the near future!!! The day is drawing very near!! I just love this glimpse into the earlier part of your adoption journey -- especially how God placed different people in your life along the way. Since I didn't "know" you then, it's really wonderful to hear about your beginnings with Munni . . . and even better to see her lovely face! I CANNOT WAIT for the day when that sweet girl is in your arms. The wait has been long, but she is so, so, so worth it! You're going to be such an amazing mama to precious Munni (you already are!!). Love this post - I love looking back and seeing God's faithfulness and direction. He longs to be in communion with us - and wow isn't it great when we respond in faith!